Rockville Nights: Rockville Pike plan hearing is "The B.F. Saul Show"
Rockville Pike plan hearing is "The B.F. Saul Show"
Better call Saul. Last night's first public hearing on the Rockville Pike Neighborhood Plan was dominated by two complaints: the width of the Pike proposed in the plan is too wide, and the recommended building heights are too short. A good number of residents turned out to hammer these points home, likely to the delight of property owner B.F. Saul, which has been making both arguments for some time. Todd Pearson, VP with B.F. Saul, testified on behalf of the company, showing a rendering of its planned Pike development that would cover 17 acres from the intersection of Halpine Road and Chapman Avenue up to Party City, and east to the railroad tracks. Pearson warned that height caps of 7 stories for residential and 10 for commercial could have "unintended consequences." Those could include severe reductions in public and green space, and a lack of varying heights within a large building, Pearson predicted. The width of the Pike should be more like what Montgomery County has planned for White Flint, 162', Pearson suggested. With the 252' width suggested by the plan, he said, there will be seven "pedestrian conflict points" for those making what he said would be a 1-minute crossing on foot. I think he had a good point when he cited the importance of extending East Jefferson through the Woodmont Country Club site, as well as the planned extension of Chapman, as important congestion relief projects. Including a jobs-to-housing ratio also irked Pearson, who suggested that if one were to be in the plan, it should encompass a much wider geographic range. Several residents testified that they moved to Twinbrook not only for the proximity to Metro, but also because they were aware of projects such as B.F. Saul's, and wanted that type of urban development. Resident Brigitta Mullican called the B.F. Saul proposal a "fantastic project." Ellen Bogage, whose firm Chesapeake Public Strategies is managing community outreach for B.F. Saul, said a petition to reduce the Pike's width has received 218 signatures as of last night. "Anything is better than what's there now," argued resident Colleen Reed. She encouraged the Mayor and Council to "recognize that Rockvillle is a city. I have no reservation about having taller buildings along the Pike." Many who testified at public hearings during the process did have reservations, however, leading the Planning Commission to scale back what would be possible on the Pike. Not everyone is on-board for narrowing the Pike. David Green, a longtime resident of Twinbrook, said he was "painfully aware" of how hard it is to get around Rockville due to the manmade barrier known as Metro. He said a 270' right-of-way was reserved along the Pike for that reason. Green termed the shrink-the-Pike effort "slick marketing. Of course the developers want more land," he said. He urged the Mayor and Council to do everything they could to promote better traffic flow in Rockville. 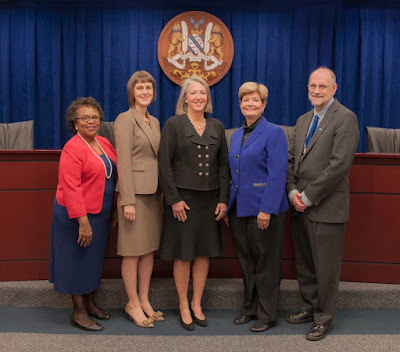 "Please approve the Rockville Pike Plan with no more changes," Green said. I got a call from Chesapeake Public Strategies, B.F. Saul's hired gun, to drum up support for this mega-project and the person on the phone only identified themselves by saying that they "...were calling on behalf on Imagine Twinbrook." They did not volunteer that they worked for Chesapeake Public Strategies or the fact that B.F. Saul was paying for their services. They ask me to come out to testify at last night's public hearing in favor of a narrower pike and taller buildings. What kind of crap is this? I have to wonder about some of the other Rockville "residents" who testified on behalf of B.F. Saul's traffic gridlock/school overcrowding project. "Dear Anonymous. Why don't you reveal yourself? Excuse me, but you are very unfair with your comment. The developer has done everything to be transparent and include the community on their proposed plan. If they didn't reach out to the community - then we would hear "the developer doesn't listen. " B. F. Saul has gone out of their way to work with the community - held meetings with the community, visited HOAs, visited with individuals, have a website and a Facebook page to explain their plan. The City requires developers to reach out to the community and B. F Saul has done that.